We had a super lovely break away to Cornwall in April for my husband's 40th birthday, staying in a beautiful self-catering chalet nestled in the dunes at Gwithian Sands. We explored some new (to us) parts of Cornwall, so I thought it would be good to share some of our favourites. It was also our first time travelling with Misty, our small dog, so this changed quite a few things! Keep reading for more info and lots of photos to whet your appetite! I can't believe that we had never visited this beautiful area before. There are miles of soft sand, stretching from Godrevy lighthouse to the Hayle estuary (strictly speaking there are 4 beaches - Godrevy, Gwithian Towans, Mexico Towans, Hayle Towans - but they all join up at low tide). There are views of the iconic Godrevy lighthouse in one direction, and St. Ives in the other, as well as large areas of sand dunes and lots of rock pools. Pretty much heaven as far as I am concerned! And, fortunately for us, the seasonal dog ban runs from 1 May to 30 September, so Misty was allowed on the beach at all times. If you are travelling with a dog, definitely worth checking up on this in advance - you can find the list of beaches with restrictions on the Cornwall government website. We started each day with a walk on the beach (what a treat!) as our chalet was only a few minutes walk away. And quite possibly my favourite day of the holiday was spent walking the length of the beach, splashing in the waves and exploring the rock pools and the dunes. I was in photographic heaven and it was so lovely to see Misty tearing around off the lead. We got really lucky with the tide times as well (another thing worth checking!). At high tide, the beach is completely covered. We returned "home" to the view below one rather windy day and it was so beautiful. Even though I was really tired, I had to capture it on camera. We both stood and stared until our legs gave way. It really was a gift. Gwithian is also a popular beach for surfing, and the Gwithian Academy of Surfing offers lessons if you fancy learning. I have lots more photos on Flickr in my Gwithian & Godrevy album if you haven't seen enough - or click through the embedded album below. We visited Porth Kidney Sands on the day we did our cliff path walk to St. Ives. We parked at Lelant Saltings and walked through some quiet lanes to reach the South West Coast Path, which leads to Porth Kidney Sands (and onwards to St. Ives). It's a beautiful route, with stunning views the whole way, and you can take the train back if you don't fancy walking (it's the most scenic train ride I've ever been on!). Porth Kidney Sands is another lovely large stretch of sandy beach, the other side of the Hayle estuary. It's just 2 miles away from St. Ives and at low tide, you can walk round to Carbis Bay. You have the same views across to Godrevy lighthouse in one direction and St. Ives in the other, as from Gwithian. It's dog friendly year round and hence quite popular with dog walkers. It was pretty much deserted when we were there, so we enjoyed complete peace and quiet. There were beautiful patterns in the sand and the most picturesque sand dunes. Most definitely worth a stop off! The views from the coast path were breathtaking too - I think my camera stayed out the whole time! Part of the walk borders the West Cornwall golf course, and in the other direction you have beach and sand dunes. The coast path eventually descends into Carbis Bay. You need to walk through the spa hotel grounds to pick it up again and reach Porthminster beach in St. Ives. Unfortunately, no dogs were allowed on Carbis Bay beach when we were there, so we found a bench with a view and enjoyed our sandwiches overlooking the beautiful white sands before moving on. You can view more photos in my Porth Kidney Sands album on Flickr, or click through the embedded album below. St. Ives really needs no introduction, but I couldn't not mention it. I love to explore the sandy beaches and the windy back streets, hunting out pretty houses and art galleries. But this time, with Misty in tow, we couldn't venture onto any of the beaches, or visit the Tate or Barabara Hepworth Museum & Sculpture Gallery. But never mind, there was still plenty to explore, and there is definitely something very special about the light in St. Ives, even when it's stormy and overcast. We stopped for coffee a couple of times at the Porthgwidden beach cafe, enjoying the beautiful views - it was unusually quiet! I can recommend a wander round the coast path on "the island" if you want to get away from the crowds - the views are lovely and there are some well located benches if you just want to sit and take it all in. The path winds round to Porthmeor beach (below right), by the Tate - another favourite (and another good place for coffee). I think my favourite beach has to be Porthminster (below), with it's beautiful views across to Godrevy lighthouse (it seemed to follow us, wherever we went!). I had to satisfy myself with a quick snap and views from afar this time though, as Misty wasn't allowed here. We thoroughly enjoyed wandering around lots of art galleries (and the vast majority welcomed well behaved dogs). I think my favourite would have to be the Porthminster Gallery which had some really beautiful pieces and an interest free payment scheme to make it easier to buy original art. We were very tempted! On the eating front, our usual haunts didn't allow dogs, so we ended up at Pedn Olva and enjoyed some lovely fish and chips (gluten free for me) with beautiful views of the harbour. They welcomed dogs and bought Misty a bowl of water and a biscuit. We'd happily return. You can see more photos, including some from previous visits, in my St. Ives album on Flickr, or you can click through the embedded album below. Porthcurno is the most amazing beach with turquoise water and soft white sand. It's hard to believe you're in the UK! The day we visited it was incredibly cold, but it looked tropical. Well worth the slightly hairy drive down some small windy lanes to get there. Food for the soul indeed. It's also the location for the amazing Minack Theatre - we didn't visit this time, but caught a performance some years back which I will never forget (at least I won't forget the beautiful sunset and scenery :). There are also some beautiful cliff path walks around Porthcurno, where you can see more jewel-like hidden coves. The paths were lined with bluebells and gorse and lots of other wildflowers - there was so much colour everywhere. 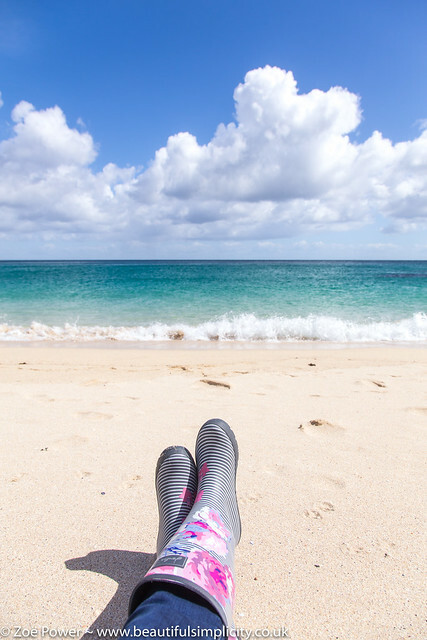 As always, there are more photos to peruse in my Porthcurno album on Flickr, or you can click through the embedded album below. We visited Sennen Cove the same day as Porthcurno, as they aren't far from each other. Sennen is another beautiful sandy beach with soft white sand, beautiful turquoise water and sand dunes (recognising the pattern here?!). It was soooo cold though - I eventually had to admit defeat when my fingers were so numb I could no longer press my shutter! It's another popular spot with surfers, although it was pretty empty when we visited (but that might have something to do with the temperature!). If by some miracle you haven't seen enough photos yet, head over to my Sennen Cove album on Flickr, or click through the embedded album below. As this was my husband's 40th birthday, we pushed the boat out a bit (for us!) and booked a week at Sauveterre Anglais, a self catering 2 bedroom beach house right by the beach at Gwithian Sands with Forever Cornwall (they have a lovely selection of properties in Cornwall). It was amazing! White wooden floors throughout, tasteful decor, modern kitchen, and the most wonderful conservatory and decking with views across the sea to St. Ives. It was the most welcome sight after our ridiculous 10 hour drive to get there (so much so that I even managed to take a few photos before we dumped our bags everywhere)! It's clear from the guest book that people come back time and time again, which speaks volumes. It's the most perfect location, full of light, comfortable, and has the most beautiful views which really expand your space. We'd so love to go back again. It's a long one, so why not make a cup of tea and get comfy first? If you fancy having a go at surfing yourself, the Extreme Academy offer lessons and hire out surfboards and wetsuits. Or if lounging and pampering is more your thing, the Watergate Bay Hotel offers spa days which includes use of their heated pool overlooking the beach. And there is of course the famous Jamie Oliver's Fifteen restaurant right on the beach if you enjoy fine dining. We usually stay in Watergate Bay in self-catering accommodation with Beach Retreats (see their Blog for lots of useful info and ideas for things to do). It's a brilliantly central place to base yourself for visiting lots of other lovely places (see the rest of this post!) and I think there is nothing lovelier than actually staying right by a beach so you can pop down whenever you want - especially good when the weather is really changeable. We'll often go back to our apartment to crash out for a while then grab our cameras and leg it down to the beach when the sun comes out. The Waves apartments are very reasonably priced - we stayed for a week in April for less than £400 (although we always stay out of season to keep costs down), but there are lots of other options too. There are also lots of eating options if you don't want to cook or drive anywhere. My favourite is the Beach Hut, with views right over the beach. But there is also the Living Space at the Hotel and the Phoenix pub. The photo below shows the Fifteen restaurant with the Beach Hut underneath it (foreground) with the Hotel behind and the eco village behind that. To the right is the Waves apartment block. By the way, this is not a sponsored post - I'm just sharing the things I love and have found useful. I have so many photos of Watergate Bay (this is a tiny sample! ), so if you'd like to see more, head over to my Watergate Bay Album on Flickr - or click through the embedded album below. Apart from running down to the beach as soon as we arrive, the first thing on the list to do is always a cliff path walk. I just love getting away from it all. The cliff paths are always so peaceful and the views are amazing. And there's something so lovely about leaving the car behind and exploring on foot. I think it's worth choosing a sunny day for this walk as it just transforms the landscape into a technicolour dream. You'll pass green rolling hills and fields full of sheep as well as hidden coves with sheer cliffs and nesting birds, inaccessible by foot. The view of Mawgan Porth from the cliff path is something very special indeed. You'll find toilet facilities as well as several eating places there (the local shop has a really nice deli and good coffee). But our favourite thing to do is picnic on the beach. You could easily spend a day here. If you fancy staying, there are a couple of hotels: The Scarlet Hotel and The Bedruthan Hotel and Spa - both also have restaurants. If you want to carry on, cross the beach to join the cliff path heading towards the Bedruthan Steps, a stunning piece of coastline in the care of the National Trust, with huge rock stacks. There is also a National Trust Cafe here if you fancy some tea and cake. Holywell beach, near Newquay, is a new discovery for us this year and an absolute hidden gem. We'd tried to visit on numerous occasions in the past, but for some reason it was always pouring with rain when we arrived, so we never got further than the local pub. But I'm so glad we persevered! 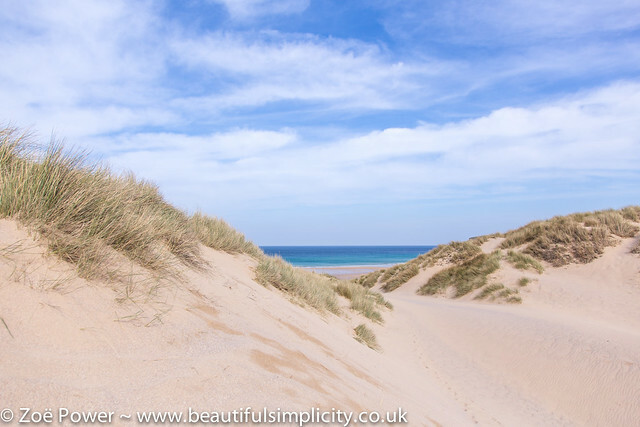 Holywell is a stunning, vast beach, with huge sand dunes (one of my all time favourite things). There is also a shipwreck and caves housing a natural holy well (hence the name). It is under the care of the National Trust and you can pick up a brilliant booklet from their hut in the car park with some lovely walks. We had the best morning pottering along the beach and dunes in the sunshine with our cameras, marvelling at the huge amounts of pretty shells. The tide was low, so we got to see the holy well and the caves. And we met lots of friendly dog walkers who shared some tips with us. We followed the cliff path over to Porth Joke (above), which looked stunning. I'd have loved to have gone further, but our tummies were rumbling as we hadn't bought any lunch with us. Never mind, this is top of the hit list for a day long visit on our next trip! Hopefully we'll also make it over to nearby Crantock beach - there's never enough time for it all, is there?! Below you will find some shell art I created with some of my beach "treasures". A lovely reminder of a super lovely day. You can find more photos in my Holywell Beach Album on Flickr or by clicking through the embedded album below. Potter round the beaches, ideally stopping to sit in the sunshine and have a paddle. My favourites are Porthminster beach and Porthmeor beach. Wander round the tiny streets, marvelling at the pretty houses and popping in and out of art galleries and independent shops (and then losing your way and ending up at yet another beach ;). Sitting in one of the many cafes, watching the world go by. I love Porthmeor cafe right on the beach (of course!). Eating! So many wonderful restaurants here. Favourites include Porthminster Beach Cafe (amazing views over the pristine beach), the Seafood Cafe for fish and chips on the main street, and Blas burgerworks if you fancy something other than seafood. Visit the Tate (currently closed until spring 2017) and the Barbara Hepworth Museum and Sculpture Gallery. Walk to Carbis Bay (and onwards to Porth Kidney Sands if you have time). You can always catch the train back - it's a really scenic route. 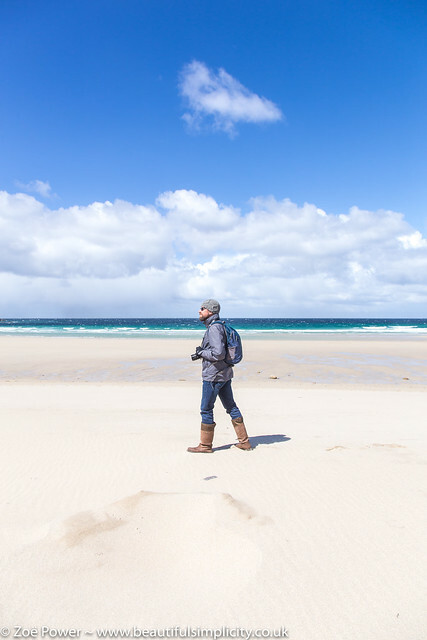 See the South West Coast Path website for more walk ideas, including this one from Carbis Bay train station to Porth Kidney Sands, returning via train from Lelant. For more photos, have a browse through my St. Ives Album on Flickr or click through the embedded album below. Godrevy is the iconic lighthouse made famous by Virginia Woolf in her novel To The Lighthouse. There are great views of it from Porthminster Beach in St. Ives. There is a lovely beach at Godrevy with some beautiful sand dunes (Gwithian Sands) above it. The land is in the care of the National Trust and there are some beautiful coastal walks here and plenty of wildlife to see. When we visited in April, we were lucky enough to see seals. I can also highly recommend the Godrevy Beach Cafe for coffee, cake, cream teas and lunch. Sandymouth beach is at the Northern edge of Cornwall, close to the Devon border. It's about a 1 hour 15 minute drive from Watergate Bay, but I really think it's worth the trek. It's a huge sandy beach, with the most amazing pebbles (I have a bit of a thing for smooth round pebbles! ), fascinating rocks, cliffs and caves. It's popular with surfers (there is seasonal lifeguard cover) and dog walkers (you can walk dogs year round). You have to clamber over lots of rather large pebbles to reach the sandy beach, so this is only one for the sure of foot. It's also really worth checking the tide times, as the tides vary enormously here and at high tide there is no beach to walk on. There are some beautiful cliff path walks too. We really enjoyed the very scenic route to Northcott Mouth. There is a National Trust cafe, toilets and car park near the beach, but otherwise no facilities. And pretty much no phone signal - so make your arrangements in advance if you're meeting people! Chapel Porth is another beautiful sandy beach, in the care of the National Trust (who also run the car park and small cafe here). The tides are rather extreme here too, so definitely check tide times before you visit. We timed it badly for several years, always arriving at high tide, and never got to see the huge sandy beach. It's another beach popular with dog walkers (although dogs are banned from Easter day until the end of September) and surfers. One of my favourite things to do here is to head up on to the cliff path and walk to the tin mines (wheal coates) - the views are incredible. See the South West Coast Path website for information about walks in the area. The stretch of coastline between Watergate Bay and Newquay is very picturesque and the cliff path walk passes through lots of beautiful beaches, including Whipsiddery, Porth and Lusty Glaze (which now hosts events and weddings and has a restaurant). It's another get away from it all day, even more so if you take a packed lunch and don't venture into Newquay itself, which is very busy. The walk is about 3.5 miles one way and you can return on the bus if you don't feel like walking back. For route details and more information, see iwalkcornwall.co.uk. 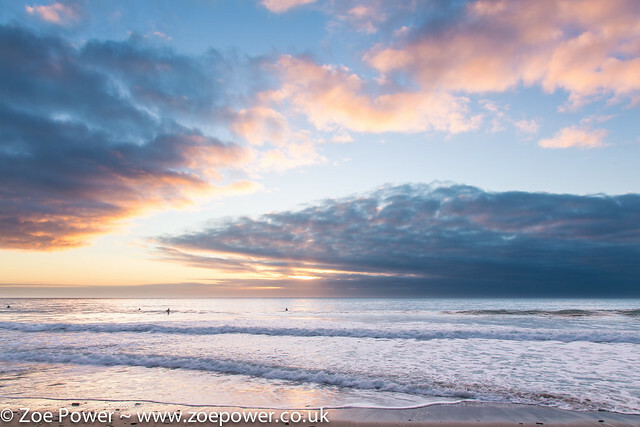 Fistral is my favourite of all the Newquay beaches and is renowned as being one of the best surfing beaches in the UK. You'll find a surf school and equipment hire, as well as lots of restaurants and shops. It hosts events and competitions and is pretty much always busy. The Japanese Garden is really near Watergate Bay and well worth a visit. It's always quiet and peaceful and a lovely place to come and reflect. 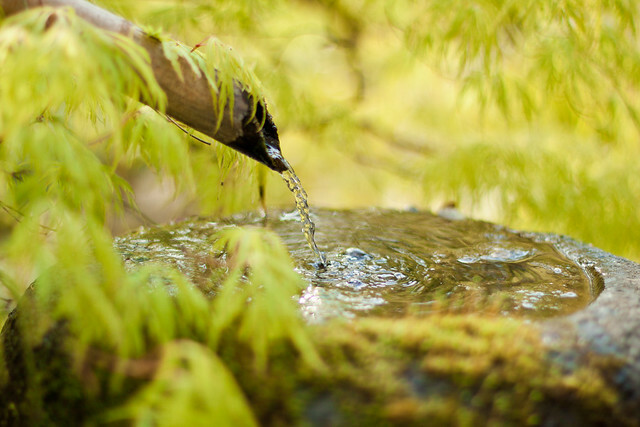 You'll find lots of Acers and water features and serenity. It is also a bonsai nursery, with a great selection of bonsais and succulents for sale, with very knowledgeable staff who can advise you about how to care for them. For more photos, take a look at my Japanese Garden Album on Flickr, or click through the embedded album below. ...because 10 places is never enough! If you have a wet weather day, head to Hawksfield off the A39 (a 20 min drive north). There's a fabulous Cafe there (I can vouch for the breakfasts! ), plus some lovely interior shops and a deli. You could then move on to Padstow. Padstow for foodie heaven and a spot of shopping - about a 25 min drive north. Perranporth for a long sandy beach and more sand dunes (in case you haven't seen enough! ); also dog friendly year round - about a 25 min drive south. Porthcurno beach and the Minack Theatre - this is a 1 hour 20 min drive south down some very hairy, narrow, windy lanes - but it's the most stunning beach with white sand and turquoise water. And watching the sun go down whilst watching a performance at the Minack Theatre is an experience you will never forget! But perhaps best visited if you are staying further South near Penzance. The Eden Project (about a 40 min drive) and The Lost Gardens of Heligan (also about a 40 min drive). They are very close to each other, so you could combine both into a day trip.